A group of PS 234 third graders are turning classroom learning into compassion and action. Many of the children in Mara Sombrotto’s class had never heard of refugees, much less knew about the Syrians who have fled their war-torn country. But when the teacher read to her class about poet Emma Lazarus and her work with Russian Jewish refugees, the lesson soon turned to one about today's Syrian refugees. The class, divided into groups, then read articles about programs that are helping the refugees. One of those groups, some half-dozen girls, took the refugees' plight to heart. “By the time they came to me ready to do their group work and talk about the articles, they had already devised a whole plan,” Sombrotto said. “We read a lot of articles about that and it was really interesting so it made all of us, including me, want to help a lot,” said student Lydia Freeman. 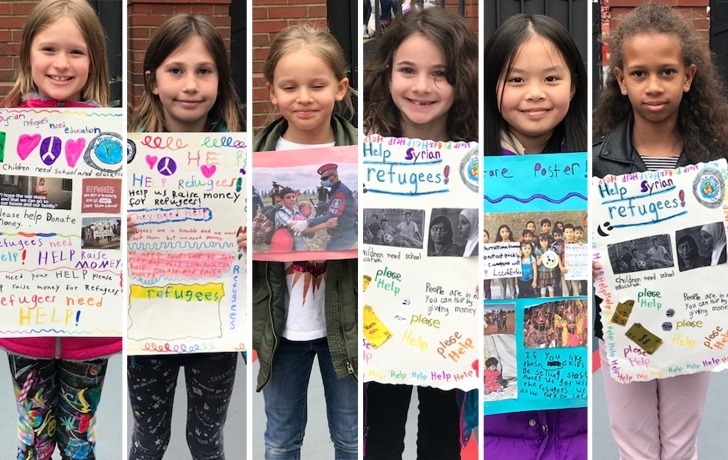 Zahana and Lydia, along with students Lila Schafer and Crystal Shao, were standing outside Tribeca’s Washington Market Park last Sunday, handling brisk sales of like-new children’s books, the proceeds to go to UNICEF for Syrian refugee relief. By the end of the day their 25-cent to one-dollar bargains would add up to $182.42 toward their eventual goal of $500. Lila’s mother, Jane King, recalled her daughter’s sudden concern for the displaced Syrians. “She was just really interested in refugees and what was going on and wanted to look at pictures of refugees and wanted to spell refugees and wanted to learn more about them,” she said.